We’d love your help. Let us know what’s wrong with this preview of Zakka Embroidery by Yumiko Higuchi. To ask other readers questions about Zakka Embroidery, please sign up. Like others have already said, this book is a keeper for its beautifully artistic designs. As I easily feel cluttered, designs that use simplicity to showcase color combinations and subtleties of shape are a breath of fresh air. Higuchi's style allows one design to be the center point so that it can be fully appreciated, which is a nice contrast to the type of embroidery designs I usually see in craft stores. I found these patterns easy to replicate (and cheap!) despite being a beginner. It was Like others have already said, this book is a keeper for its beautifully artistic designs. As I easily feel cluttered, designs that use simplicity to showcase color combinations and subtleties of shape are a breath of fresh air. Higuchi's style allows one design to be the center point so that it can be fully appreciated, which is a nice contrast to the type of embroidery designs I usually see in craft stores. I found these patterns easy to replicate (and cheap!) despite being a beginner. It was also obvious that my first attempt did not live up to the pictures, but they were inspiring enough to keep me going and I quickly noticed improvement. There are only 8 types of stitches used in this book, which contributed to ease of learning. I thought the repetition of the same stitch over and over in a pattern quite lovely. All of the small sewing projects that showcase these patterns were things I would make to gift or use. One thing I greatly appreciate is that each pattern is made up of several smaller pieces. That way you can choose how much time you want to spend embroidering and do, say, one flower or a whole collection. They are also easily replicated on household items you would like to personalize (tea towel, canvas shoes, tote ect. ), even if you don't want to do the small sewing projects. For a full review and pictures visit The Willow Nook! This is a book filled with designs that are examples of stunning simplicity. The first section is filled with monochrome projects. The line design is creative and filled with so much style. The second part of the book is multi-colored designs. Again, the combination of design and color is really stunning and eye-catching. There is really something for everyone. The rest of the book is filled with templates, instructions, and patterns that make it look easy enough for beginning embroiderers, but This is a book filled with designs that are examples of stunning simplicity. The first section is filled with monochrome projects. The line design is creative and filled with so much style. The second part of the book is multi-colored designs. Again, the combination of design and color is really stunning and eye-catching. There is really something for everyone. The rest of the book is filled with templates, instructions, and patterns that make it look easy enough for beginning embroiderers, but still creative enough for the more-skilled makers. As I flipped through the projects, I found myself flipping faster and faster to see all of the wonderful designs/projects. I was torn because I wanted to savor every image and plan how I'd tackle each project (and who I'd give the gifts to), but on the other hand, I wanted to get to the end of the book so I could drop everything and immediately start. An advanced copy of this book was provided to me through Netgalley in exchange for an honest review. This gorgeous book is right up my alley. As a knitter, spinner, dyer, and formerly an avid sewist, I am always interested in other fiber and needle crafts. I've been drawn to single color embroidery lately and Yumiko Higuchi's designs and inspirational pictures make it easy to find a jumping in point. I can easily see myself using some of these designs on future knitting projects or to embellish An advanced copy of this book was provided to me through Netgalley in exchange for an honest review. This gorgeous book is right up my alley. As a knitter, spinner, dyer, and formerly an avid sewist, I am always interested in other fiber and needle crafts. I've been drawn to single color embroidery lately and Yumiko Higuchi's designs and inspirational pictures make it easy to find a jumping in point. I can easily see myself using some of these designs on future knitting projects or to embellish kitchen towels, headbands, etc. Zakka Embroidery shares simple one-and-two color embroidery Motifs that are simply elegant! Taking the patterns from nature, the author provides instructions to craft easy-to-make gifts for adults and children that should please everyone. I hope to be one of the first to purchase a personal copy and then, maybe one for the library, too. Thanks to Netgalley and Roost Books for providing this proof. I love how serenity just leaps from the pages of this wonderful book. Set in two parts, the first for one color embroidery and the second for two color embroidery, the projects are far from what you might think boring. These rather effective and beautiful projects from flowers and insects to sailboats and birds, brighten up any garment or bag. Yumiko is amazing at what she does and her book is filled with ideas. Along with a stitch guide, patterns and templates, this is a book that I think every st I love how serenity just leaps from the pages of this wonderful book. Yumiko is amazing at what she does and her book is filled with ideas. Along with a stitch guide, patterns and templates, this is a book that I think every stitcher will love. It will be inspirational for beginners and a perfect gift for advanced level sewists. An adorable little book, and I do mean literally, it's a pleasure to hold and skim through. I loved the idea of single and two color embroidery but I felt like the book is too rooted in the zakka, cute Japanese aesthetic. Single color embroidery could be very impactful and I suppose I was missing what could be done in arenas other than collars and pinafores, projects I'll never replicate. While I appreciate the projects and patterns found here, none of them were something I'd ever try or use. Lovely, and very simple. This would make an excellent introductory book, and the patterns are fantastic for a variety of levels. I would have loved to see a few more stitches used throughout the book, but the resulting projects have a very tidy, streamlined style with smaller vocabulary of stitches. I also really enjoyed the colorsense of the projects here. Wonderful and inspiring, can't wait to see if I can pluck up the courage to have a go! I loved this book. Not only are the designs very appealing, they're also easy to do, simply explained and wonderfully created. I cannot wait to try a few. Lovely little book. Has the how-to info, but focuses on the inspirational pictures. Loved that book - the design looks cute and modern and not impossible to achieve - definitely need to borrow again so that I can have a go at some of the motifs. I was afraid this book was going to be all "Japanese cute" but many of the designs are taken from nature and they are all rather wonderful in their simplicity. Fantastic resource with gorgeous designs and thorough, easy to follow instructions. A lovely book of designs which are simple, modern and stylish. There are many projects, showing the use of embroidered motifs on different types of crafts such as clothing, bags, homewares and much more. I must say I had never heard the term 'Zakka' before, but nevertheless this book is well worth a look for anyone interested in textile and needlecrafts. Ideal for both beginner and more advanced stitchers, there are easy step by step instructions and templates to follow. An advance copy was provi A lovely book of designs which are simple, modern and stylish. There are many projects, showing the use of embroidered motifs on different types of crafts such as clothing, bags, homewares and much more. I must say I had never heard the term 'Zakka' before, but nevertheless this book is well worth a look for anyone interested in textile and needlecrafts. Ideal for both beginner and more advanced stitchers, there are easy step by step instructions and templates to follow. 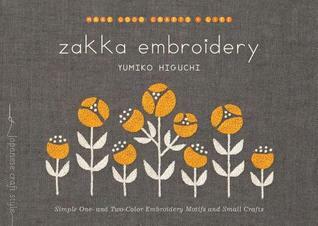 Zakka Embroidery is a great little book absolutely bursting with cute yet fairly easy designs. This is a great book for beginner embroidery enthusiasts. See my complete review, including photos and a sample project on my craft blog Wavoki Crafts. Extensive collection of adorable, elegant patterns for flowers, snowflakes, trees, animals and other designs. The work is beautiful, and the patterns (at the back of the book) are complete and very well written. A section explaining how to do other stitches is included as well. This is a inspirational book for any level of embroiderer, and compares favorably to other embroidery how to books that I have read.